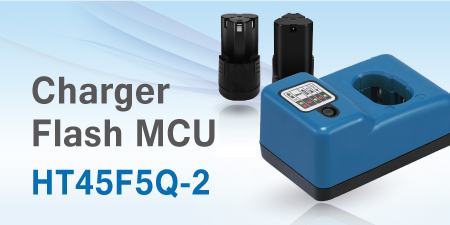 Following the successful previous release of its predecessor HT45F5Q device, Holtek is now delighted to announce the release of its new Flash MCU, the HT45F5Q-2. When compared with the HT45F5Q, this new device has greatly enhanced MCU resources in terms of I/O ports and the inclusion of a UART function as well as a charger management module. These enhancements allow for easier implementation of the necessary constant voltage and constant current battery charge control requirements. The device has a 2K×16 Flash Program Memory, a 128 byte Data Memory, a 32 byte True Data EEPROM, a high accuracy internal RC oscillator of fixed 8MHz frequency and a 6-channel 12-bit Analog to Digital Converter for voltage, current or temperature measurements. As for timer functions, the device includes a single 10-bit Compact Timer Module, which not only provides the usual basic timer functions but which can also generate PWM output signals for fan speed control. The UART function is used for communication with external peripherals. With regard to protection functions, the device includes an LVR function which is used to monitor the system voltage to avoid any unstable operations resulting from an out of spec operating voltage. The charger management module can implement both constant voltage and constant current battery charge control. The charger management module is composed of two parts. The first part contains two groups of OPAs and D/A Converters, which are used to control the charging voltage and current. The charger constant voltage and constant current upper limit value is obtained using a software configured D/A Converter. The 12-bit D/A Converter is used for constant voltage control while the 8-bit D/A Converter is used for constant current control. The second part of the charger management contains a fixed gain operational amplifier gain which is used for current amplification. This improves the current resolution and allows the use of smaller current detection resistors thus reducing the amount of energy consumed by the resistor. As a highly functionally integrated MCU, the required number of external components is greatly reduced, resulting in the added benefits of smaller PCB areas and reduced manufacturing costs. By using the charger management module’s internal D/A converter, both the charging voltage and current correction parameters can be stored in the device’s internal EEPROM, which can offer savings over the traditional manual correction techniques, thus providing major production efficiency advantages. The supplied 20-pin NSOP package type, with its small outline profile, is also well suited to the charger application area. As is the case with other Holtek 8-bit MCU devices, this device meets with full industrial specification requirements and has excellent noise immunity characteristics. In terms of its safety and stability characteristics, this new device compares excellently with other presently available charger solutions.